Jenkins, who has spent more than 30 years at the EPA, was the first agency official to warn of the dangers of the caustic dust rising from the ruins of the World Trade Center. The dust, which had dangerously high pH levels, was so corrosive it caused chemical burns to the lungs of firefighters and other rescue teams. Hundreds of workers spent weeks at the scene without protective gear such as respirators. Subsequent research has shown as many as two-thirds suffered permanent lung damage. Medical experts now believe much of the health effects could have been prevented if workers were issued proper safety gear. At the time, however, Christine Todd Whitman, then head of the EPA, claimed there were no readings to indicate a health hazard. Whitman has since said the Bush administration did not want to cause panic. But Jenkins accused the EPA of deliberately concealing the dangers. She noted that the EPA had been downplaying the air quality hazards from such rubble since the 1980s, and that European standards were far more stringent. After repeating the charges to Congress, Jenkins was harrassed by her superiors. She was eventually sacked in late 2010 after being accused of physically threatening her supervisor. Jenkins, who is a polio survivor, has a petite frame. Her male supervisor is over six feet tall. In its decision, the Merit Systems Protection Board said Jenkins had been wrongly denied her right to due process on a number of counts. The ruling marks the second time in her long career that Jenkins has fought the EPA – and won. In the 1990s, she was transferred out of her job after accusing Monsanto of falsifying a study on the cancer risk from exposure to Agent Orange. An administrative judge later ruled she had been wrongly transferred. This is *excellent* news. We could use some. It sounds very much as if Ms. Jenkins was "McKinney'ed", in a parallel with what happened to former GA representative Cynthia McKinney. McKinney was an almost unique voice for 9/11 Truth in Congress, and in 2005, she had the guts to stand up in the House of Representatives and ask some pointedly awkward questions to former Defense Secretary Donald Rumsfeld, regarding that $2.3 TRILLION (?/!!) missing from the Pentagon, which was announced to the Senate, by Rumsfeld, on September 10, 2001. Also questioned were Chairman of the Joint Chiefs of Staff Richard Myers, and Under Secretary of Defense (Comptroller) Tina Jonas. This confrontation happened, oddly, on March 11, exactly 6 months from the 4th anniversary of the 9/11 attacks. She was arrested after being accused in a trumped-up charge of "assaulting a Capitol police officer". Upon reading the reports in the corporate media, one would think that she tried to "punch out the officer". However, the story from McKinney herself is completely different - that she was stopped by Capitol police, arbitrarily, as she was hurrying into the building to cast a vote. The cops claimed that "they didn't recognize her" - a most unlikely story considering her unique looks, and the fact she was on first name terms with the Capitol police... they all know each other. Furthermore, how many black, female, US Congresswomen were there in 2005? Maybe TWO - the cops knew EXACTLY who she was. She was groped and manhandled by the cops, probably trying to get to to lose her cool in order to effect an arrest. She pushed the officer's arm away - most women being groped in that fashion would have reacted far more strongly. That was the limit of McKinney's reaction. She was later arrested and put through the legal mill. Negative headlines were all over the media, universally assuming that the cops' story was correct, and giving the impression that she was "unstable", or even psychotic (! ), despite the obvious problems with the "official story" (!). As a result of this incident and the associated bad publicity, she lost her seat in Congress in the following year. Whether the Rumsfeld incident was the trigger, nobody's saying, obviously... but McKinney asked the wrong questions to some very highly privileged, well-placed, and extremely suspect individuals, and it is likely that she was set up, perhaps in revenge? (if they could betray a CIA field agent with impunity, then a black congresswoman would be like a walk in the park). In a similar parallel, Cate Jenkins lost her job on account of making her boss Christine Todd Whitman (and others above her), appear like the filthy liars they really are. And we know that the Bush White House ordered the EPA to cook the books and fabricate their studies of the dust to "minimize the danger", thereby misleading GZ workers and first responders - thousands were sickened and over 1000 have died, partially as a result of these lies, of toxic dust related illnesses since. Incidentally, according to many first volunteers and first responders, people were ordered not to wear haz-mat gear on the Ground Zero site. In contrast, responders at the Pentagon were not permitted to work on that site without full protection. Cate Jenkins' was prominently featured in the documentary "9/11, Dust and Deceit" (2007), where she gives first hand testimony about the fabricated reports. How many officials in the Bush Administration and the EPA got busted for reckless endangerment, criminal negligence, deliberately fabricating reports, or ordering a cover-up, and lying to the public? Silly question. bloggulator on Tue, 05/08/2012 - 10:56pm. Indeed, a "rare victory for whistleblowers"
"It was also a rare victory for whistleblowers, said lawyer Paula Dinerstein. "This doesn't happen that often."" That's for sure! but a welcome victory indeed. My sincere congratulations to Cate Jenkins. She also wrote an excellent article published in the Journal of 9/11 Studies a few years back. ProfJones on Mon, 05/14/2012 - 11:34am. well this info here needs to get out. IMHO this is a smoking gun. This is from a peer reviewed medical journal. Carbon nanotubes (CNT) of various sizes and lengths were noted. 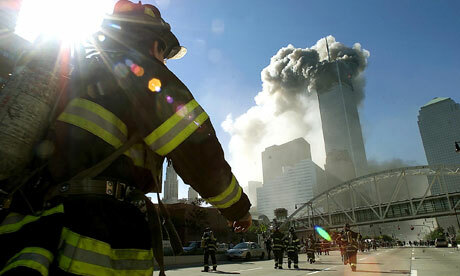 CNT were also identified in four of seven WTC dust samples. Discussion: These findings confirm the previously reported association between WTC dust exposure and bronchiolar and interstitial lung disease. Long-term monitoring of responders will be needed to elucidate the full extent of this problem. The finding of CNT in both WTC dust and lung tissues is unexpected and requires further study. A summary of the mineralogic analysis in correlation with pathologic features is given in Table 1. Four of the seven WTC dust samples contained CNT. The lung specimens of three of the patients with interstitial disease (Patients A, B, and C) contained CNT (Figure 3A) virtually identical to those of the dust samples (Figure 3B) and of the positive control sample (Figure 3C). CNT seen were all single-walled and of various lengths. They were mostly ropelike under electron microscopy. The fourth patient with CNT had mild chronic bronchiolitis and occasional peribronchiolar and submucosal fibrosis (Patient D). The nanotubes identified in patient lung samples appear mostly in single or pairs. The single nanotubes are indicated by arrows in all graphs of Figure 3. Most CNT seen in the CNT-positive control and WTC dust samples were stacks of single nanotubes, thus appearing to be variable in thickness. No CNT were found in the lungs of either the 40 construction workers or the 20 negative control samples. indio007 on Mon, 05/14/2012 - 10:39pm.